For last 2.5 years, every weekend I am attending Gita Sopanam classes, conducted by Samskrit Bharati. Today, let me share some glimpse about this course and some interesting facts, that I learned in the course. I came to know, about Samskrit Bharati long back. My late sister gave me its Girinagar, Bangalore address. Girinagar is very far. One day, I came to know about free evening spoken Samskrit classes, then weekend Gita Sopanam classes also announced. I just enrolled myself. 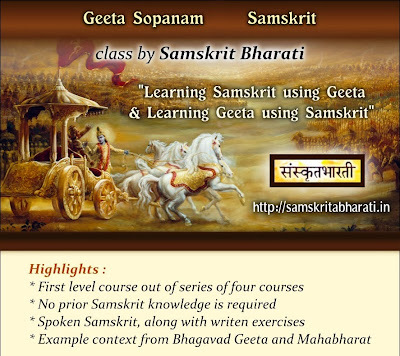 Gita Sopanam is a unique way to teach Samskrit. 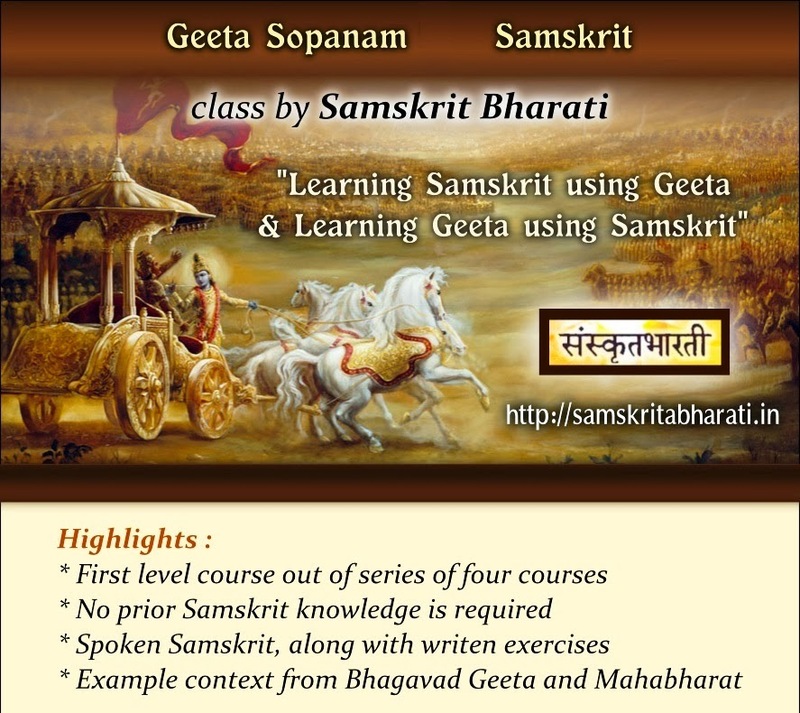 Samskrit Bharati designed this course, considering that many people have love and respect for Bhagavad Gita. Many people read it daily. They read just translation in their native language. How about teaching them Samskrit, so they can read and understand without need for translation. Dr. Viswas conceptualized this idea. Watch him, talking about Gita Sopanam course. Click here 1 Click here 2 The course divided in 4 parts. Each part is called Sopanam. Sopanam means step. So Gita Sopanam - 1 course is first step, or fist part. First 3 parts focus on grammar aspects. It is like teaching Gita using Samskrit and Samskrit using Gita. All the example, context is from Mahabharat epic and Bhagavad Gita. Gita Sopanam 4 is about Gita. We discussed grammar aspects of each Sloka / verse from Gita. We can understand Gita directly in Samskrit. Samskrit Bharati is not preaching about Gita. It is not discourse on Gita. Samskrit Bharati makes enable the people to read Gita. The organisation equipped the people with Samskrit knowledge, so let people themselves figure out what is written in Gita. In this process of Gita, the students introduced to great Hindu philosophy from Gita. The Students amazed with great capability of Samskrit language. Samskrit is such a rich language that one can convey many things with fewer words. The syllabus includes some inspirational incidents, some day to day life event like planning an event, some funny story like a story about Albert Einstein, some humor, some puzzles and some wisdom. The teachers make the course more interesting by some celebrations, some cultural activities, contest, Gita sloka chanting, Samskrit songs and what not. I never felt any burden of learning. It is learning with fun. I became student again. We all classmates are from different age-group, different profession and different mother tongues. Few things are common in us. Samskrit. Proud for Samskirt and proud for the great Indian culture. A desire to learn this scientific language and to keep it alive. Mutual respect in an informal learning environment. I had my last class yesterday. We just looked back and found, that we all are coming here for last 2.5 years. We did Gita Sopanam 1 from July 2011 to Dec 2011, Gita Sopanam 2 from Jan 2012 to Apr 2012, Gita Sopanam 3 from Jun 2012 to Dec 2012 and Gita Sopanam 4 from Jan 2013 to Dec 2013. We all enjoyed learning together. Now, let me share, during these 2.5 years some very touchy stories, wisdom, content from our text books. Gita Sopanam 3: Albert Einstein's story. He simplified his theory of relativity and with great enthusiasm he taught. The students responded with request to further simplify it. Einstein narrated a story. A handicapped man A say on shoulder of blind man B and both started bagging. Once A request B to go to a restaurant to have a cup of milk. B, being blind do not know what is milk, so A explained. A:"Milk is White colored drink". B: "I drink water, so I know what is drink, but what is white?" A: "It is like color of feather of Swan"
B:" Feather I know, but what is Swan?" A: "It is a bird whose neck is curved"
B: "I hear daily birds sing in the morning. I have neck. but what is curved?" A just hold B's hand, make it curved and explained him this is curved, not straight. B: "Oh now, I know this is milk"
Gita Sopanam 1 or 2: There was a great sage. When he meditate, he meditate so deeply and become still, so surrounding birds feels, he is dead and they sit on his shoulders and play. By seeing that, few youngsters requested the sage to catch few birds for them. The sage agreed. He mediated. However, that days, his meditation was not so deep. Somehow, the birds realize that, it is dangerous to sit on the shoulder of the sage. Gita Sopanam 1 or 2: People give so much importance to behavior, dos and don'ts compare to knowledge and philosophy. If a Bhraman declares that tomorrow is Ekadashi, so everyone should observe fast, people happily observe fast. If the same Bhraman declares that "TVAM BHRAM ASHI" "AHAM BHRAM ASHMI" etc. People doubt it. Gita Sopanam 4: The whole book is grammar explanation of Gita, the lord Krishan's message to the world, with opinion from great scholars like Ramanujacharya and Madhavacharya. So, yes I enjoyed this course. Last 2.5 years VASOOL. i strongly recommend everyone to attend it. Samskrit Bharati is an International non-profit making NGO. You can find out nearest center (Gita-Kendra) and enroll yourself. These may be free class or with very nominal fee. How strange it is. Many of us proud to be Hindu, supporters of BJP, RSS, ShivSena, Narendra Modi and with great proud for our Vaidic culture, heritage etc. There is nothing wrong in it. However, more important is regular reading Gita. We often visit Facebook to know, updates and messages from friends. Gita is message from the God. How often we read it? Bath is necessary for cleanliness of body. Gita-Study is necessary for cleanliness of mind. I wish, let's all be proud of human being. Let's study this wonderful book Shrimad Bhagavad Gita. Gita does not belong only to Hindu religion. It is a universal truth. 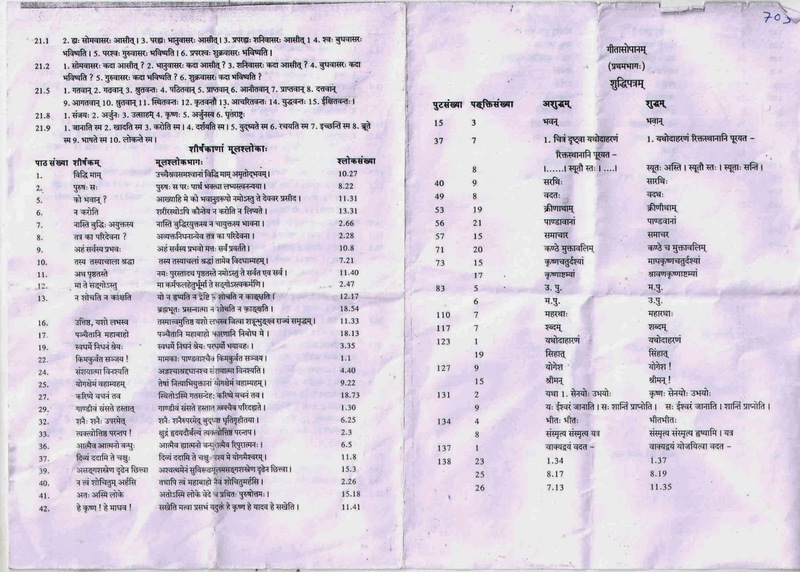 Let's study this wonderful, scientific, sweet language Samskrita. Samskrit is no where related to Hindu or any religion. It is just a language. The best language. p.s. I got these 2 scanned pages about some error correction etc for Gita Sopanam - 1 book. Just for ready reference for the readers. Manish bhai, very nicely written experience. 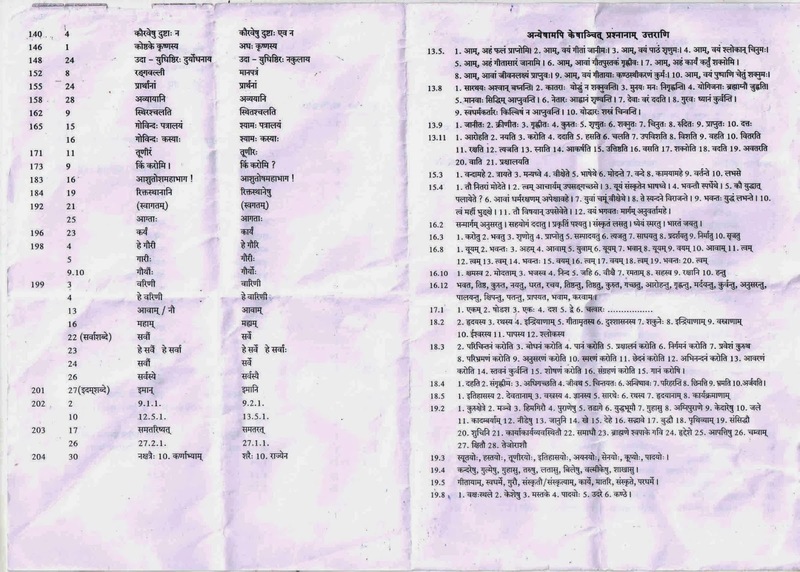 Seems Samskrit Bharti doing excellent job of teaching Sanskrit. I see even young kids learning it. Hi! I'm interested in learning Sanskrit. Please let me know where can I buy the books Geeta Sopanam. Are they available to buy online? Yes, they are available online at http://samskritabharati.in/store. Alternatively, you can go to sanskritabharati.in and click the 'BookStore' link in the header. 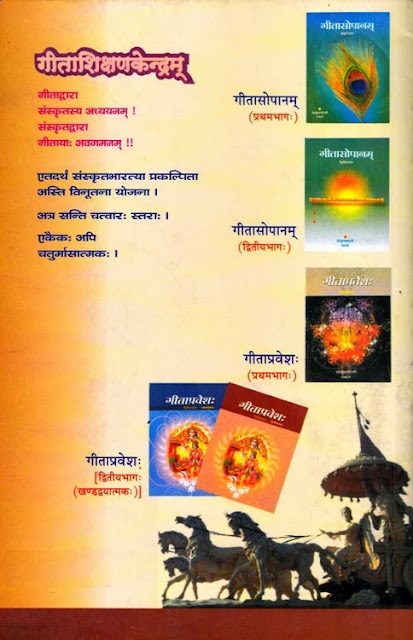 Along with Gita Sopanam, a lot of other books are available and video material as well.